28 3/4″ x 9 1/2″ x 9″. All valve (cathode biased). Single channel. A JMI design (Derek Underdown). VALVES: normally* ECC83, ECC807 and ECC88 in the preamp, EZ80 rectifier, and 2 x EL84. Around 10-12W output. CONTROLS: volume, treble, middle, bass; top boost switch; speed and depth (tremolo); reverb. EFFECTS: tremelo and reverb switched on or off via a footswitch. SPEAKER CABINET: 28 3/4″ x 19 1/2″ x 11 1/4″. 2 x 10″ – two Celestion 7442s. Provided either with side stands, or a swivel trolley with a top bar for the amp to sit on. 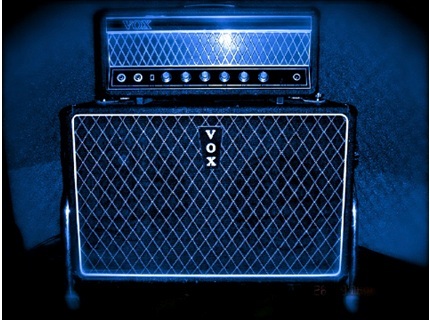 Metal loops under the amp and tongues on top of the cab kept the amp in place when side stands were present.